In the remote area of Death Valley National Park known as Devil’s Hole, six men suit up for a long day of desert exploration. But these explorers are swapping their dusty hiking boots and water bottles for neoprene wetsuits and oxygen tanks. As NATURE’s Life in Death Valley reveals, the men are part of a specialized team of divers who assemble in this 40-acre pocket of Death Valley four times a year to monitor the population of the park’s most surprising desert creature: the critically endangered Devil’s Hole pupfish. Death Valley may seem an unlikely habitat for a fish, but this tiny species has managed to thrive here for thousands of years despite epic changes in its environment. When summer temperatures spike to 120 degrees, it’s difficult to imagine Death Valley in an ice age. But twenty thousand years ago, the valley rested beneath a vast lake system where the ice-age ancestors of these pupfish swam. As the climate warmed, the lake dried and formed separate pools, and the fish that were once part of the same parent population began to develop unique characteristics in response to their individual environments, eventually evolving into several distinct species of pupfish. But it’s the fragile Devil’s Hole species that has made the biggest waves throughout history, primarily due to the place it calls home. Located in southern Nevada, the “hole” itself is a fissure in the earth’s surface that split open 60,000 years ago to reveal an astonishing underworld: a water-filled limestone cavern. Ironically, beneath the hottest, driest place in the Western Hemisphere stretches a vast aquifer system. The opening at Devil’s Hole is one of the few places in Death Valley where the water from this system meets the surface. Marshall’s team is part of a larger recovery effort that includes representatives from the National Park Service, the Department of Fish and Wildlife, and Nevada’s Division of Conservation. 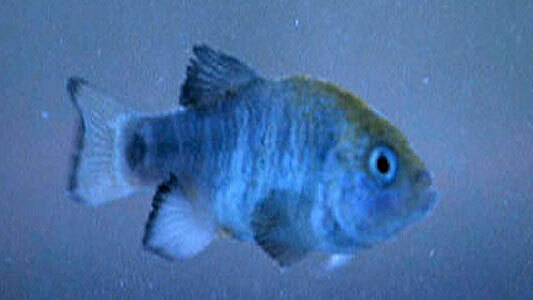 “This pupfish is the most restricted vertebrate species in the world,” says Marshall. It was that exact notion that prompted President Harry Truman, in 1952, to protect the unique pupfish and its habitat by designating Devil’s Hole a disjunct part of Death Valley National Monument. For nearly two decades, the fish enjoyed a protected haven. But by the late 1960s, development and nearby farming beyond the boundaries of the monument began to take a toll on the water levels in Devil’s Hole. As the pupfish do most of their feeding and spawning on an algae-carpeted limestone shelf just a few inches below the surface, a small drop in the water level was all it took to bring the fish to the brink of extinction. What ensued was a bitter contest over water rights that pitted developers against conservationists and the federal government against a corporate farm. In the end, the fish reigned victorious. In 1976, the U.S. Supreme Court issued a landmark ruling that protected not only the fish but also their fragile habitat by specifically stating that water levels in Devil’s Hole must remain high enough to completely cover the spawning shelf. As a result of the ruling, development was halted, and the fish became one of the very first species to be protected under the Endangered Species Act. Since then, Devil’s Hole has been cordoned off from park visitors by a chain-link fence that runs the perimeter of the hole. Only members of the recovery team are permitted access in order to perform quarterly counts of the fish. From 100 feet beneath the surface, the team works their way up in pairs, counting and measuring every fish they see. This provides them with an index of how the population is doing. Despite 30 years of federal protection, recent counts suggest grim news: the fish’s population is once again plummeting. Linda Manning, a biologist for Death Valley National Park has been working closely with the Pupfish Recovery Team. “Right now we are very concerned because we recently had the lowest count in 32 years — only 123 fish,” she reports. In addition to conducting quarterly counts of the fish, the Park Service has installed monitoring wells near Devil’s Hole to keep an eye on the water levels, which have been dropping gradually over the past 14 years. Development and groundwater pumping in nearby Pahrump, Nevada, has long been suspected of affecting the water level in Devil’s Hole, though many Pahrump officials deny the allegations. Before that happens, the team will continue to do all they can to ensure the Devil’s Hole pupfish keep hold of their well-earned reputation as resilient survivors.